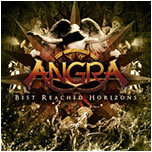 RockUnitedReviews: ANGRA: "Best Reached Horizons"
The best of both words? Indeed, if you're looking for the ultimate Angra compilation look no further since this is probably it? "Best Reached Horizons" sums up the two different faces and ages of the Brazilian band. Disc one covers the era of original vocalist Andre Matos (1993-1999) while disc two handles the years of Edu Falaschi (2000 and forward). Sadly not remastered though? and it's a shame really since the early stuff could most certainly do with an face-lift. You'll quickly noticed how they've changed throughout history and time as the first disc material leans a lot more towards progressive metal than later work. Both era have its particular charm and selling points but some of their better songs (in my humble opinion) are the more recent ones. Several different compilations and live albums are out there already but this one holds tracks such as "Freedom Call" taken from the EP as well as the cover of Led Zeppelin's Kashmir. Liner notes by guitarist Rafael Bittencourt and the twenty tracks were all hand chosen by their other guitarist Kiko Loureiro.